Spread out a picnic lunch: pearl couscous salad and Spanish ham and cheese sandwiches. Spiced apple cider will keep your hands warm after you're done. There’s a lot to be said for picnicking on a cool day: the air feels fresh, the sun gleams brightly but benevolently, and parks and beaches are empty of crowds. It’s often a beautiful time to be outside, particularly when you’ve brought a thick blanket to sit on and a lunch that includes thermoses of hot soup. 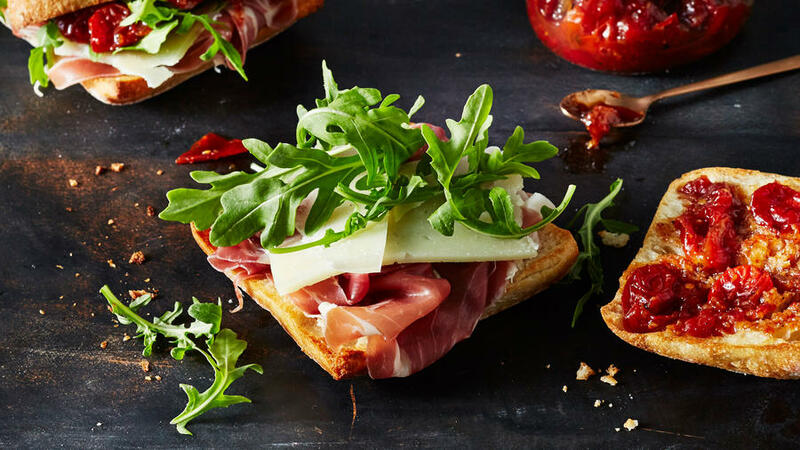 Cool-season picnic fare can be hearty and assertive, like our saffron-spiced carrot and white bean soup, and Spanish ham and Manchego cheese sandwiches spread with tangy tomato jam. Add a delicious winter-fruit salad and dark chocolate ― fromage blanc brownies for an indulgent interlude. It’s important to pack foods at a bacteria-safe temperature: keep hot soup and cider in thermoses, and salads, sandwiches, and other drinks in a cooler with frozen gel packs. Use to-go containers to create individually boxed meals, which travel well. Prepare the sandwiches on round rolls so they fit neatly into empty soup bowls. Parchment paper wrapped around the sandwich can do double duty on your lap as a drip-catcher.